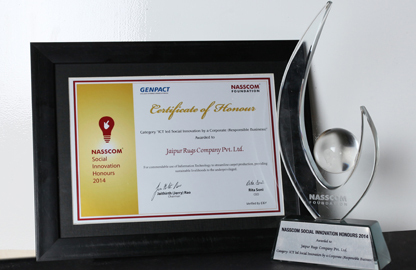 Celebrating the spirit of innovation and Technology for Social Good, NASSCOM Foundation presented their prestigious Social Innovation Honours award to Jaipur Rugs. The award was conferred under the ‘ICT led Social Innovation by a Corporate’ (Responsible Business) category. The Honours recognize innovations that creatively leverage Information and Communication Technology to create solutions to address gaps in social development. The Honours have recognized innovations focused on financial inclusion, employability, education, health, employability, governance, financial inclusion, and citizen services in the past. ICT Innovation: Carpet weaving has been the main means of livelihoods for a number of artisans in India. The award recognizes Jaipur Rugs for using a unique social entrepreneurship model leveraging Information Communication Technology (ICT) to encourage the craft among the communities. The recognition is further attributed to Jaipur Rugs’ capacity in facilitating research, using quality driven technology in the rug industry and using eco-friendly technology in designing the rugs. Jaipur Rugs has deployed ICT to streamline the production process starting from yarn production to delivery of products, generating employment for 40000 grassroots level people. Technology is used to create designs for the carpets; villages are linked using Virtual Private Networks. Jaipur Rugs uses technology effectively for the rest of the process – monitoring, quality check, date recording and analysis etc. making the process more efficient and impactful. About NASSCOM Foundation NASSCOM Foundation is driving technology for good. The Foundation’s work is just as expansive and evolutionary as the potential that technology and corporate India entail. Drawing strength from its parent body NASSCOM, the Foundation works in partnership with four major stakeholders : NASSCOM member companies, NGOs, emerging social enterprises, and Government, changing India bit by bit, a journey to foster a strategic relationship between technology and development.